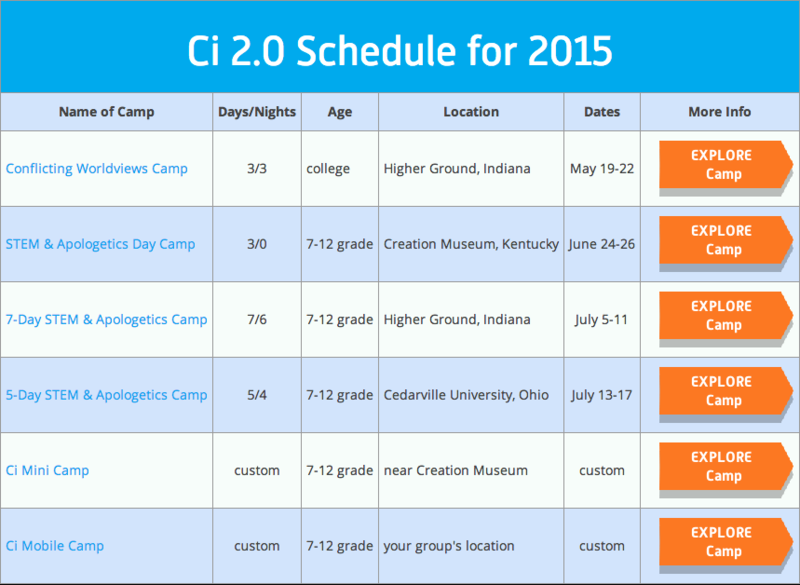 Ci 2.0 Summer Camp Details This summer we are offering several STEM camps for junior high, high school and college students. We are pleased to announce the dates, programs, pricing & our newly-designed Tuition Reduction Program so our campers and their families can plan a Ci Experience into their summer schedules. Explore CampInfinity.com for more details on our schedule for next summer. Explore our website for more details on the Ci Registration Process. Explore our website for more details about our Tuition Reduction Program. Camp Infinity announces our premiere presentation which captures the story of Ci 1.0's 144 hours of engaging STEM & world view activities. These amazing hours have been compressed into this 3 minute video designed to give parents insight so they may determine if Camp Infinity is the best investment for their child. After an incredible first summer of camp with the most amazing, godly, self-sacrificing STEM college students, we brought them together to capture their impressions about Ci 1.0. Be inspired by what they have to say about the kind of students who are an excellent fit for a Ci Experience. 5 - number of top positions in Google for campinfinity.com with search phrase "STEM camp bible"
If you would like to be used of the Lord to help meet these needs, you can donate securely using PayPal. Designate your donation to [email protected] which is registered with PayPal or use this secure donation link. If you would prefer to write a check, make it out to "Camp Infinity" and mail to 122 Montverde Drive, Greenville, SC 29609. Your entire donation will be used to help academically gifted and financially needy students attend Ci 2.0. 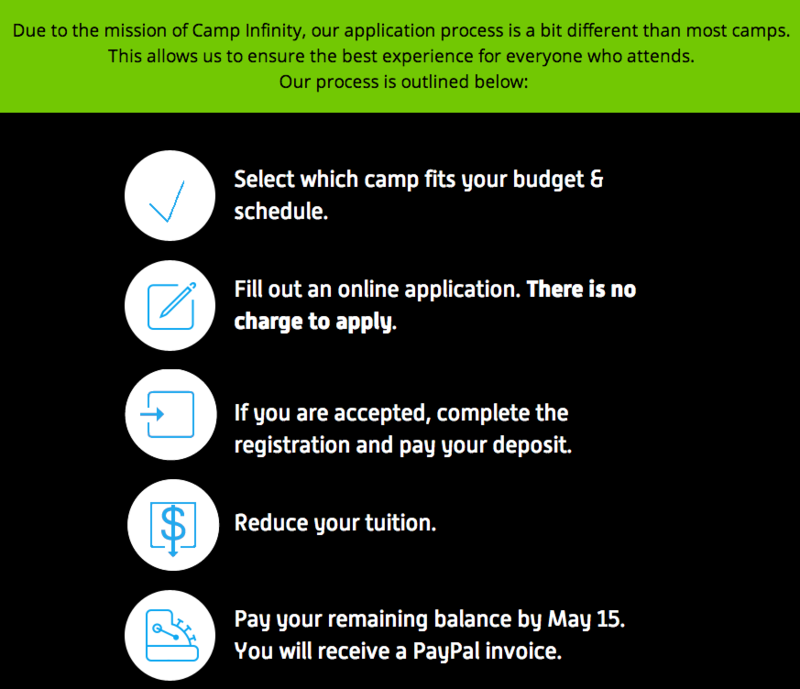 Camp Infinity is a registered 501c3 with the IRS. Thank you for your interest and prayers for Ci. We rejoice as we see the clear hand of God opening doors for Ci 2.0 in 2015 and beyond. If you know of a young person (grades 7-12) who has an appetite for knowledge and the pursuit of truth, please tell them about Ci 2.0 events. We are excited to be working on a 6-year curriculum that will engage a young person from 7th through 12th grade, preparing them to pursue their higher education and become modern day Daniels who are competent to stand before the kings of their culture and proclaim God's Truth and point them to Jesus Christ!